It’s not an understatement when people describe the holidays as the happiest time of the year. The holiday season is all about enjoying the little things; like spending time with family, watching holiday movies, and overall making memories with the people who mean the most to you. Whether you’re attending a gathering, decorating your home or preparing for a festive family photoshoot, the holidays are bound to bring happiness and joy to all. Amidst these activities, a lot of money can be spent if you’re not too careful. The money used for purchasing presents, decorations or those cozy holiday pajamas can add up faster than you think. But with the right preparation, mindset and these valuable tips, you’ll make it through the holiday season with minimal debt! Considering what to get your family and friends is one thing but analyzing the cost behind their requests can be quite intimidating. Everyone loves the thought of giving and receiving presents, so making someone feel special through the effort you put into their gift is essential. At the same time, your bank account could suffer from too many costly items. To ensure you don’t exceed your price limit, create and print a spreadsheet and take it with you on your shopping spree. If you’re a recent graduate or young adult who is pretty limited when it comes to spending due to college debt, consider refinancing to lower a student loan. That way, you’ll drop the price of a pretty heavy payment, and have more money to work with in your budget for gift giving! With DIY trends on the rise, there is no doubt that planning a ‘do it yourself’ present for someone is a great idea to save you some cash. Children and parents love receiving things that are homemade — there is more of an appreciation for your hard work and dedication to finishing a unique project. Search for a fun and creative way to incorporate the holidays into an arts and crafts activity. If you are required to travel during the holiday season to visit family, consider booking your flight or another form of transportation far in advance. When you purchase a plane ticket with a distant departure date, airfare is much cheaper, which can save you money for other traveling expenses such as a carry-on bag or a seat upgrade. If you’re not an overspender, consider a travel credit card to gain rewards. In the long run, you’ll save money that can be used for great incentives for future fights! Also, if your job has the benefit of paid time off, request this kind of time so your time away from the office won’t hurt your paycheck. Buying a fake tree is a great way to not only save money this year but to do so for years to come. Yes, going to chop down a real tree is a tradition for some, but a fake tree can be kept forever and re-used annually, making it a more economical option than buying a real one every year. If you’re worried about an artificial tree taking away from your holiday cheer, incorporate the scent of pine by lighting a candle, melting wax cubes or spraying a pine-scented air freshener. If spending time with your friends is the main priority throughout the holidays, finding and buying presents for each person individually can cost a lot. To help you all save some cash, suggest a Secret Santa event and determine a price limit. To put on a successful Secret Santa, write each participant’s name on a piece of paper and put them all in a hat or bowl. Whoever you choose, that is the only person you buy for. Through this activity, everyone receives and gives a gift, which makes it extra special! Many families spread their holiday cheer through creating a holiday card and sending it to other family members and friends in the mail. Unfortunately, these can be quite costly and can take up to a week to complete and send out depending on the size of your mailing list. Manage your time by creating an email greeting card! This kind of service can be free, and if not, there are always coupons or discount codes to use to lower your total cost. If you want to add a little fun, incorporate music and display animation on your card for an interactive touch. 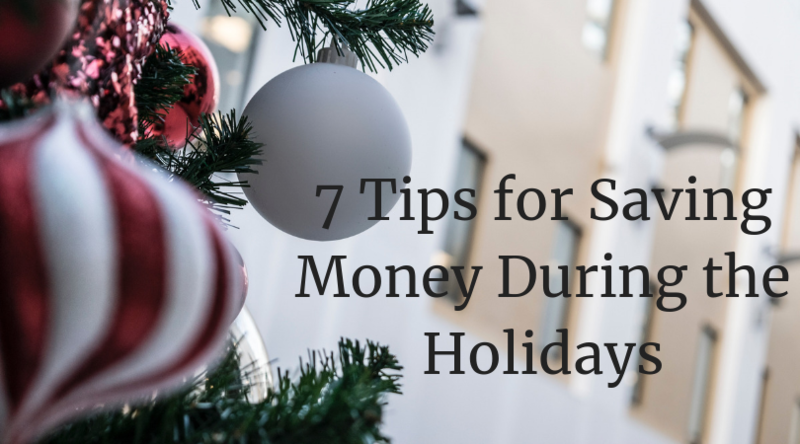 We all know that can be difficult to save money during the holiday months. The store shelves are stocked with candy canes, coffee shops have their signature peppermint blend and restaurants have their designated holiday dish to serve. The urge to buy is off the charts! Saving involves a major focus on determining what you really, truly need versus what you want. Instead of impulse buys like purchasing a morning coffee on the go, make coffee at home more often. You’ll be shocked at the amount of money you will save! Do you have any additional money-saving recommendations? Comment down below with your favorite ways to save during the holidays!